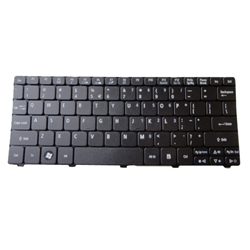 Description: New genuine Acer Aspire One netbook keyboard. This original black keyboard includes the ribbon cable and is the perfect repair part for replacing your existing keyboard that is missing keys or not working. Compatible Part #'s: KB.I100A.086, PK130D32A00, MP-09H23U4-6984, PK130D34A00. Acer Aspire One 521, 522, 533, D255, D255E, D257, D260, D270, NAV70, PAV01, PAV70, ZH9.